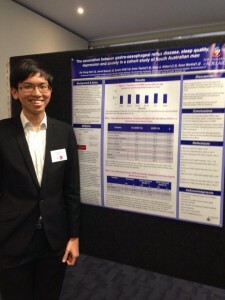 Congratulations to Zhi Xiang On who has recently presented the results of his research project on “The association between Gastro-Oesophageal Reflux Disease (GORD), sleep quality, depression and anxiety in a cohort Australian men”, at both the South Australian and Victorian annual scientific meetings of the Australian Society for Medical Research (ASMR). On was a 2013-14 Summer Vacation Research Scholarship student with the Freemasons Foundation Centre for Men’s Health. On is now in his last year of his arts degree majoring in Psychology and Sociology at the University of Melbourne. He was supervised by Dr Sean Martin, Professor Gary Wittert and Dr Zumin Shi, and received research support from the staff of Population Research and Outcomes Studies Unit. These presentations demonstrate what can be achieved in a 6 weeks research placement in terms of outcomes of a project and development of essential research skills. On’s project was to examine the prevalence of GORD in a community-based sample of middle-aged to elderly Australian men and investigate the association between GORD and common mental health disorders such as anxiety and depression. The novel component of this study, not previously addressed by other research, was to look at how the association is influenced by sleep quality. The study used data available for the MAILES male cohort study. On found that there is a high prevalence of GORD (37%) in men aged 35-80 years and age did not influence this prevalence. He found a strong, independent association between anxiety and poor sleep quality on GORD and that sleep quality likely mediates the previously reported relationship between GORD and depression. This entry was posted in News, Research and tagged anxiety and depression, GORD, men's health, mental health, scholarships, sleep. Bookmark the permalink.